There’s nothing here you don’t already know, but you also know you want to read it. Go ahead. Indulge. 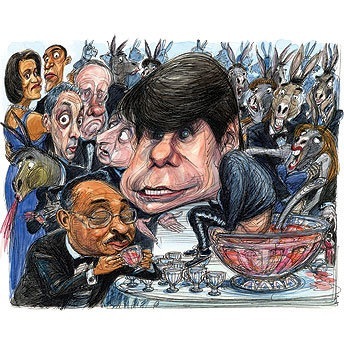 … To allow a craven scum eater like Rod Blagojevich to worm his way into the national political arena at precisely the moment when Barack Obama was supposed to begin restoring the great-power credibility America lost during the Bush years would be an almost unforgivable mistake. But that’s exactly what happened. Because Obama or no Obama, the Democrats are still the Democrats, and there still isn’t any political fight, it would seem, that they can’t find a way to lose.